With a carefully created range of dishes to appeal to every appetite and whim, our menu features plenty of locally sourced and flourishing ingredients. Combine our food with something from our characterful drinks collection and you'll have the recipe for a most enjoyable meal. All freshly cooked to order, our food includes plenty of hearty and delicious options for laid back dining, light bites and bar snacks to accompany drinks with friends and a great selection of sides to mix and match. Our blackboard always features an extra special fish dish, a homemade pie and regularly includes seasonal specials like autumnal game or a summer superfood salad. We like to embrace tradition at The Bakers Arms and we'll use any excuse for a celebration. We serve up special menus at Christmas and for Valentine's Day, Pancake Day and Saint Days and our Sunday Roasts suit Mothers Day, Fathers Day and Easter Sunday perfectly. See What's on for more. We're lucky to be close to some of the South's best microbreweries, distilleries and craft ale companies so at The Bakers Arms, you're spoilt for choice when it comes to excellent quality drinks. Our wine list comprises of some fabulous favourites of the house, selected from award winning vineyards. We also list a selection of intriguing vintage wines at very competitive prices so you can confidently indulge in something extra special. There is always a delectable collection of dessert wines, ports, single malts and brandies to choose from too. If the non-alcoholic option is more your thing, we've found some true local juice gems as well as offering plenty of refreshing long drinks. 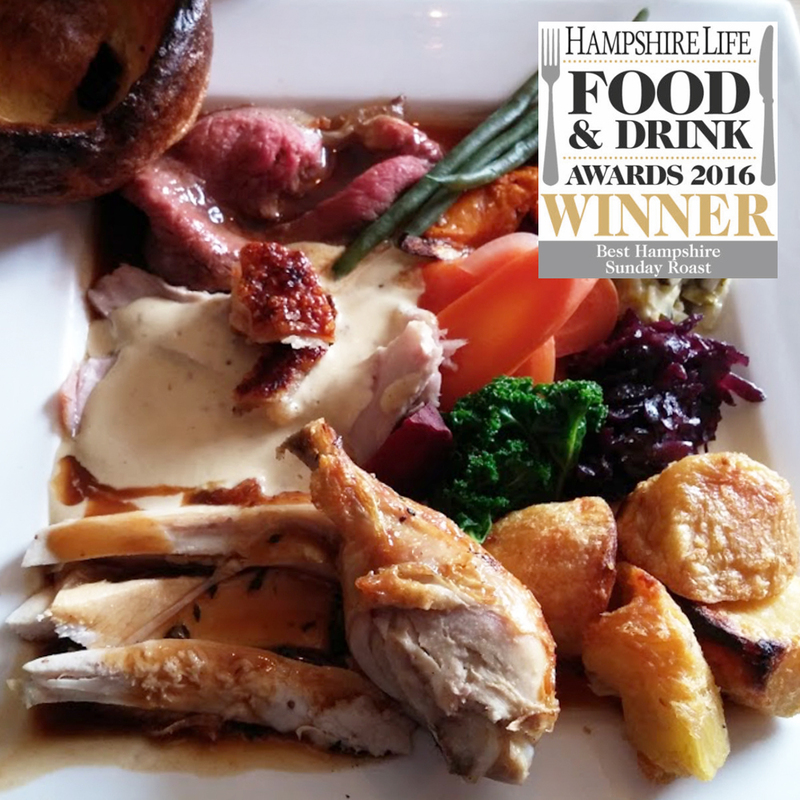 Our Sunday Roast is hailed to be the best in Hampshire. Enjoy roast sirloin of Hampshire beef, loin of Hampshire pork, roast chicken or 'The Bakers Roast' which is a taste of all three. All dishes come with their own gravies and an impressively wide selection of beautifully cooked vegetables. We always have a veggie option and our signature 'Crab Thermidore' available too. Our food is specially prepared to order so we can create it to suit you. Let us know how you like your steak, or if you have any specific dietary requirements or preferences. We always include a carefully considered choice of dishes which are vegetarian, vegan and gluten free so if you're following a particular diet, you don't have to make do with anything less than delicious. We haven't forgotten the little ones either. There's a kids menu to suit even the most discerning children and plenty of options on the main menu that could prove popular too. On Sunday, we serve half-sized roasts for children (and those with less hearty appetites) and if you'd like supper in the week, one child eats half price* with every adult ordering a main course before 6.30pm, Monday - Thursday. T&Cs apply, see menu for details. At The Bakers Arms, we do like a good pud. Ours are always homemade to our own tried, tested and highly rated recipes, it's always worth leaving a little bit of room to squeeze one in. We also always offer a selection of locally made ice creams and sorbets from our friends at Caroline's Dairy. If you don't have much of a sweet tooth (or you still have the space) we have a fabulous cheese board with locally sourced cheeses and biscuits and our signature chutney. There's a proper coffee machine so we can brew to your liking and we serve a great cup of tea too. By this point we hope you'll be feeling thoroughly satisfied (and pretty full) and keen to come back and join us another day.